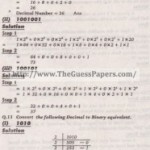 (ii) Who proposed fourteenth points? (c) Agha Siraj Durrani . (vi) When did All India Muslim League come into being? (xii) Citizenship is acquired by Two ways. (xiii) How many ixn,portant elements of state are there? Q..2 write five elements of Nationality. Q.3 write five sentences on Pak-China relations. Five sentences on Pak-China relations are following. (i) The Republic of China is neighbouring country of Pakistan. China always supports to Pakistan’s issue at every occassion especia1Iy on the issue of Kashmir. (ii) “Heavy Mechanical Complex” at Taxila was established on January, 1963 with the cooperation of China. (iii) China gave aids during the reconstruction of Silk Highway. (iv) Pakistan played an important role in improving better relations between the United States and China in 1996. (v) China has established many trade agreement with Pakistan. The relations between the two countries are considered very good. Q.4 Write the political thoughts ‘of Sir Syed Ahmed Khan in five sentences. The political thoughts of Sir Syed Ahmed Khan in five sentences are following. 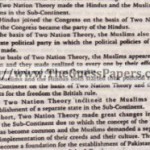 (i) Sir Syed Ahmed Khan was the first leader who used to word “Nation” for the Muslims of the Sub-Continent, thus a way was established for “Two Nation Theory”. (iv) Sir Syed Ahmed Khan demanded for the first time for separate elections during his speech on January 16, 1888 in Meerath. (v) Sir Syed Ahmed Khan established Anjuman-e- Muhiban-e-Watan” in August 1888 for making the government realized that the public did not want a state with Congress rule. Q.5 Write five duties of Non-Muslim citizens. Five duties of Non-Muslim are following. (i)It is the duty of a non-Muslim citizen to remain loyal for the state. (iii)It is the duty of a non-Muslim citizen to avoid the use of all those things openly which are unlawful according to the teachings of Islam. (iv)It is the duty of a non-Muslim citizen to playa role in the progress and stability and takes state enemy as personal enemy. (v)It is the duty of every non-Muslim citizen to stop himself from being involved in destructive activities. Q.6 What do you know about national integrity? Write in five sentences. Five sentences on national integrity are following. (i)The process of unity of different classes and groups in order to achieve common purposes is called National Integrity. (ii)National integrity provides the opportunities of getting progress of the state. (iii)Due to national integrity. the individual of a nation co-operate each other. thus a nation becomes strong. (iv) If the right concept of the Ideology of Pakistan to be explained then national integrity can be progressed among people. (v)For the development of national integrity. there is need to spread the education everywhere by which people become ready to co-operate each other. Q.7 Write five powers and duties of legislative. Five powers and duties of legislative are following. (i) The essential duty of legislative is legislation. it constitutes laws according to the need of society. v) In every state, the legislative that provides advisory and investigation. Q.8 Describe the relations of Pakistan and Afghanistan. (i) Pakistan established relations with Afghanistan in 1948 and provided the country the facilities of import and export through Karachi seaport. (ii) During 1954-55, when Pakistan signed defensive agreement SETO and SENTO then Mghanistan criticized on it. When one-unit was established in Pakistan then Afghanistan also made a hostile reaction. (iii) An agreement allowing trade passage to Afghanistan through Pakistan concluded between the two countries in 1958. (iv) Zulfiqar All Bhutto paid a visit to Afghanistan in 1976. (i) The Prime Minister performs important duties about the administration of the government. (ii) The Prime Minister distributes different ministries. among the members of the cabinet according to their ability and efficiency. (iii) The Prime Minister supervises the defence of the country and performs important duties related to foreign affairs. (iv) The Prime Minister has powers about financial affairs. therefore he performs important duties about financial affairs. (v) The Prime Minister gives his advice to the president in the selection of the officers in administration, loyal and judiciary posts. Q.10 write five sentences on information Technology ? Five sentences on Information Technology are following. (i) Information Technology helps in quick exchange of the news and the events of the current affairs in the whole world. (ii) Trade can be made more extensive with the help of Information Technology. (iii)It is a source of providing quick awareness about the changing world. (iii) It has been proved highly beneficial both in war and peace. Q.11 Write five merits of Dictatorships.? Five merits of Dictatorship are following. (i) All the powers are concentrated in t he hands of a person. He may enforce his orders and does not care the opponents. (ii)During critical situation or in crisis, Dictatorship is proved to be an effective government. (iii)Reliable and effective affairs can be appointed on political posts under the management of Dictatorship. (iv)Proper attention is given to -defence and for the improvement of armed forces under Dictatorship. (v)In Dictatorship, there is political stability, therefore better planning for economy can be made. Q.12 Write the definition of state as given by Professor Laski. The definitions of state as given by Professor Laski is following. Q.13 Point out five main problems of Karachi City. (i)The problems of unwarned load shedding of electricity. (ii)The problem related to the laws of traffic. (iii)The problem of short supply of drinking water. (iv)Unsanitary condition of sanitation on roads and streets. Q.14 Write five sentences on good governance. Five sentences on good governance are following. (i) In good governance every adult man or woman has a right of giving opinion without any distinction of colour, race or religion. (ii) The basic principle of good governance that the majority winning party should be provided the right of forming the government. (iii) In good governance, the opposing party is the opposition which informs the general public about the unfair policies of the government. (iv) Free elections are the characteristics of good governance, the people are free to caste their votes according to their will without feeling any pressure or fear. (v) In good governance, there is supremacy of law. All citizens are equal according law of the state and the judiciary protects the law. Q.15 Write five merits of Democracy. (i) In Democracy, the government is elected through public opinion, therefore the government takes care the interest of general public. (ii) Every individual has economic, political, social and every kind of liberty in democracy. (ill) Common people takes part directly in the affairs of government, they keep watching the conduct of the government, therefore they get political training through this process. (iv) Democracy is such type of government which cultivates educational, intellectual and moral characteristics of common people. (v) In Democracy, the concept of mutual respect and co-operation are progressed. In this system of government, the head of the state has to face the criticism of common man. Q.16 What is Kashmir Issue? (i)Kashmir is the word “K” in Pakistan, this valley is located in the northern region of the sub-continent. The Hindu Raja of Kashmir announced the occasion of Kashmir to India on October 27, 1947. (ii) India presented Kashmir Issue in the Security Council of UNO in 1947 for the first time. (iii) The Muslims were in majority in Kashmir and they wanted the occassion of Kashmir with Pakistan. (iv) Kashmir Issue is the great obstacle in establishing better relations between India and Pakistan. (v) Pakistan and India’ both are doing efforts that Kashmir Issue is to be solved through negotiations and mutual agreements. Q.17 Define Society. Write down its importance. (ii) According to Linton, a group of people living together for long at a same place and become organized due to common actions, so it can be taken as a unity is called Society. (iii) F.H. Giddings says that society is a collection of individual having common thoughts. According to Aristotle “Man is a social animal.’ Society is a human organization and man cannot live without it. Society comprises some certain purposes due to them the importance of society is increased. The importance of society can be described by following points. (i) Society plays an important role in the construction of personality of an individual. The attachment with a society gives opportunity to learn many a things. (ii)A society helps in providing the necessities of life because the wants of an individual are unlimited and he cannot fulfill them alone. (iii) Society helps in caring and growth of children. (iv) An individual can get the moments for recreation within a society. People adopt various professions in a society due to which one gets moments for recreation. (v) Society provides protection of life and wealth to human beings because people live together in a society and work for each other. (vi) Man have to face many natural calamities in his life like earthquake, cyclones, stonns, flood, diseases and war. All these problems can be handled properly within an organized society. (vii) In a society people receive the opportunities to use their capabilities, thus not only an individual but the whole society gets a progress. (viii) Society helps individuals in getting knowledge about institutions. It also cultivates mutual co-operation, common action and sympathy among individuals. Q.18 Define state and describe the elements of an Islamic state? Population is an essential element or the state and the concept of the state is not possible without population. According to Plato, the state is not produced from a tree or from a rock but is formed by individuals. China and India are the states with large population. Plato gave an opinion that a state is constituted by the population five thousand and forty people. According to Aristotle the population of ten thousands to one million is necessary for the formation of a state. In modern period Rousseau also support the concept of less population in a state, according to him. the population of ten thousand people is enough for a state. In modern states, the’ population is in millions. makes the states distinctive from all other institutions. Due to this the state becomes authorilive internally and externally. Internal Sovereignty means the law of the state which’ is applicable within the geographical limits of the state though the powers of the government have been distributed among central government and its institutions but each institution uses its powers in the name of the state. External Sovereignty shows the liberty of the state from external factors. The American states are not called as True States because these states are bounded with the rules of the central government in many ways. 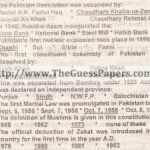 The Sub-Continent before partition in 1947 was not an actual state though it has other three characteristics, when the Sovereignty was given to two states then two Sovereignty states Pakistan and India were established. Territory is the body of a state, government is its brain, population is its organs and Sovereignty is its soul. As the body becomes dead without soul, the state comes to an end with the separation of Sovereignty. Q.19 Describe the problems faced by Pakistan just after its creation? (i) According to Mabil Hill, Civics is the study of institutions municipal corporation, cities, towns, provincial governments, central government, political institutions and religious institutions. (ii) The useful branch of human knowledge which deals with everything relating to a citizen, past, present and future. The subject matter of the study of civics is related to all the aspects of human life. The study of civics gives complete information from the rights and duties of citizen of the states, social distribution, system of government, section of government. It also gives knowledge about municipal corporations, political institutions and religious institutions. The knowledge of civics manages the lives of citizens and produces noble qualities among them by which they can pass their lives within discipline and principles. The knowledge of civics helps in becoming a good citizen, this can be explained as following. The knowledge of civics explains that the noble qualities like intelligence, controlling of desires, honesty and patriotism should be necessary for a good citizen. After the complete awareness of the rights and duties, the citizens of state try to prove them as good citizens. The study of civics gives a complete description about the central government and other type of sub-government in which p~ov!ncial governments, local governments, city government, district government, town systems are included. Thus the citizens get knowledge about the government and sections of government in their state. Q.21 Write notes on any Two of the following. In 1927, the British Govern declared that collective constitutional proposals were brought before the legal experts. The congress decided to call a conference of all parties in India. In 1928. a meeting of all parties was held but no decision was made. The Congress established a committee under the presidency of Pandit Moti Lal Nehru. Quaid-e-Azam Muhammad Ali Jinnah refused to accept Nehru Report and prepared a model for the guiding principles for making constitution, these guiding principles became popular as Fourteen Points of Quaid-e-Azarn, The fourteen points of Quaid-e-Azarn are following. (1) . The form of the future constitution should be federal with the residuary powers vested in the provinces. (2) A uniform measure of antonomy should be granted to all provinces. (3) All legislatures in India should be constituted on the definite principle of adequate and effective representation of minorities in every province without reducing the majority in any province to a minority or equality. (4) In the Central Legislatures, the Muslim representation should not be Icss than one-third. (5) Representation of communal groups shall continue to be means of separate electorate as at present provided if shall be open to any community at any time to abandon its separate electorate in favor of joint electorate. (6) Any territorial redistribution that might at any time be necessary shall not in any way effect the Muslim majority in Punjab; Bengal. and North-West Frontier province. (7) Full religious liberty i.e. liberty of bclief, worship and religious observance, propaganda, association and education shall be guaranteed to all communities. No bill or resolution shall be passed in any legislature if three-fourths of the members of any community in that particular body oppose such bill or resolution on the ground that it would be injurious to the interests of that community. (9) Sindh should be separated from the Bombay Presidency. (10) Reforms should be introduced in the North-West Frontier province and Balochisran on the same footing as in the other provinces. (11) Provision should be made in the constitution giving the Muslims an adequate share along with the other Indians, in all the services of the state and in local self-government bodics keeping due regard to the requirements of efficiency. (12) The constitution should embody adequate safeguards for the protection of the Muslims culture and for the protcction and promotion of Muslims education, language, religion, personal laws and the Muslims Charitable institutions and for their due share in the granrs-in-aid given by the stare and by local self-governing bodies. (13) No cabinet either central or provisional, should be formcd without there being a proportion of at least one-third Muslim ministers. (14)No change shall be made in the constitution by rhe central Icgislature except with the concurrcnce of the stares constituting the Indian Federation . (ii) The name of the state is Islamic Republic of Pakistan. (iii) According to the constitution the official religion of Pakistan is Islam. (iv) Steps shall be given to enable the Muslims of Pakistan to order their lives in accordance with the fundamental principles of Islam. (v) The Teachings of the Holy Quran and islamiat shall be compulsory. Seeps shall be taken for the publishing of the Holy Quran without any mistake. Suitable facilities will be provided to teach the Arabic language. (vi) Proper organization shall be made (or the system of Zabt, Auqaf and Mosques in Pakistan. (vii) No law would be made against the teachings of Quran and Sunnah. All existing laws shall be brought in conformity with the injection the Holy Qur’an and Sunnah. (viii) Islamic Ideology Council shall be established which would give the opinions about the Islamic way of life. (ix) A person who has an implicit faith in the oneness of Allah and in the prophethood of Hurat Muhammad (peace be upon him) as the last prophet of Allah will be considered a Muslim . (x)The State shall take steps fee the unity with the Muslim countries in the world.